Fine-particle pollution associated with haze threatens the health of more than 1 billion people in China. Extremely high PM2.5 concentrations are frequently observed, especially during the winter haze event in northern China. Even after accounting for aerosol–radiation–meteorology feedback and improving the emission inventory, state-of-the-art models still fail to capture the observed high PM2.5 concentrations, suggesting that key chemistry is missing for secondary aerosol formation. To improve the prediction and control strategy of PM2.5, we are in urgent need of a better understanding of the chemistry of secondary aerosol formation. Thus, we launch the special issue "Multiphase chemistry of secondary aerosol formation under severe haze" to promote research and discussion on this topic, which is highly relevant for both atmospheric chemists and the public. The special issue is open for all submissions which address, but are not limited to, the following questions concerning secondary aerosol formation. What are the key oxidation pathways leading to aerosol formation under clean and polluted conditions? What is the role of multiphase chemistry versus gas-phase chemistry? 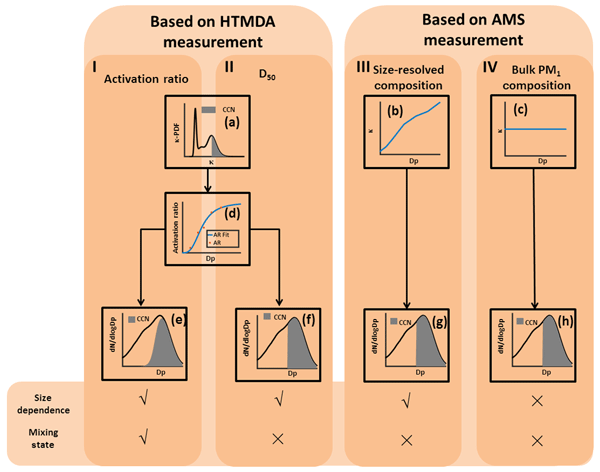 Are laboratory-determined kinetic data of multiphase chemistry directly applicable for ambient conditions, and if not, how can the reaction kinetics relevant for ambient conditions be derived and determined? What is the aerosol particles’ and droplets’ pH and how does it influence the multiphase chemistry? What is the role of the RH, temperature and aerosol phase state in multiphase chemistry, and how does aerosol mixing state play a role? What is the contribution of aqueous secondary organic aerosol (SOA) formation under highly polluted conditions? The hydration of SO3 to produce H2SO4 is an important process in the atmosphere. 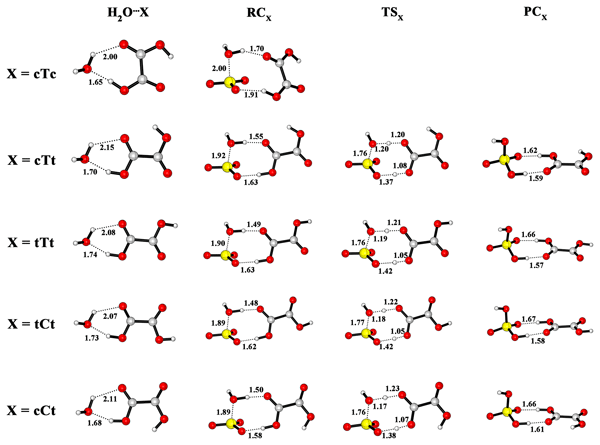 Using quantum chemical calculations, we investigated the catalytic role of oxalic acid in the SO3 hydration reaction. The results show that oxalic acid is effective in facilitating the hydration of SO3 to form H2SO4. The kinetic analysis result indicates that the oxalic-acid-catalyzed SO3 hydration can play an important role in the upper troposphere. BrC may significantly affect aerosol radiative forcing and the magnitude of which is typically deduced from BC absorption measurements, assuming a unit AAE of BC. Here, we estimated the error associated this AAE segregation method for various configurations of BC core and coating materials. We also evaluated the BrC contribution to the aerosol radiative forcing in the PRD region and a table was constructed to easily assess BrC radiative forcing efficiency for various aerosol optical properties. 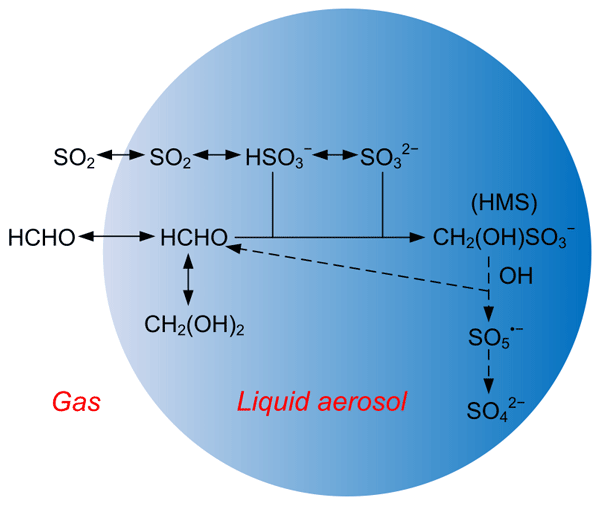 A novel method to determine the concentration and the isotope of WSOC in aerosols is established and applied in the analysis of a serve haze in East China. The results show that the studied site is affected by the photochemical aging, biomass burning and dust aerosols in different episodes during the sampling period. The analysis of WSOC and its isotopes offers a great potential to better understand the source emission, the atmospheric aging and the secondary production of WSOC. Based on the data analysis of simultaneous measurement of N2O5 and ClNO2 in a severe winter haze in the Pearl River Delta, this study underscores the importance of N2O5 heterogeneous reactions in nitrate formation and calls for better parameterization of N2O5 heterogeneous chemistry in order to predict haze pollution in China. 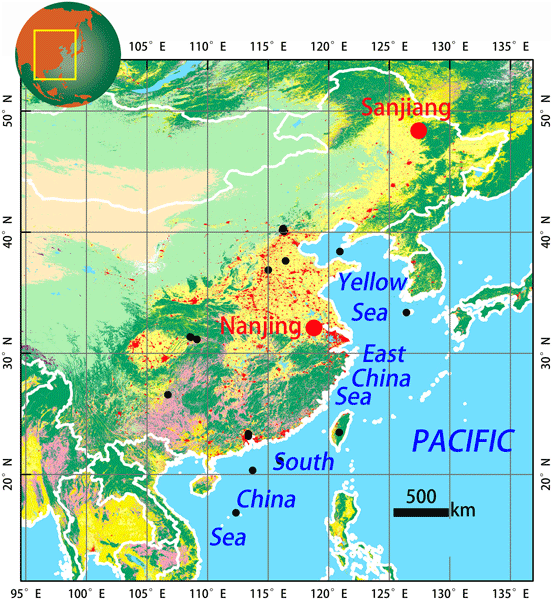 A total of 2 years of online measurement of particulate nitrate was conducted at the SORPES station in the western Yangtze River Delta, eastern China. Nitrate was found to be the major driver of haze pollution and behaved differently in different seasons. In summer, thermodynamic equilibrium and photochemical processes controlled nitrate formation. In winter, N2O5 hydrolysis was demonstrated to be a major contributor to the nitrate episodes. 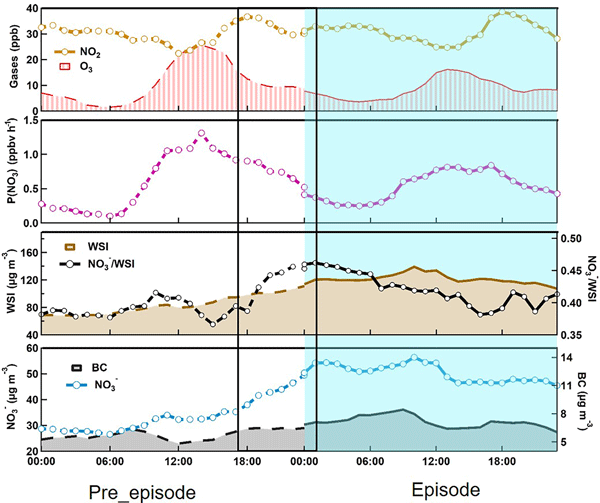 We present the first observations of the oxygen-17 excess of atmospheric nitrate (Δ17O(NO−3)) collected in Beijing haze to reveal the relative importance of different nitrate formation pathways. We found that nocturnal pathways (N2O5 + H2O/Cl– and NO3 + HC) dominated nitrate production during polluted days (PM2.5 ≥ 75 μg m–3), with a mean possible fraction of 56–97 %. We demonstrate that it is imperative that future studies, making use of isotope mixing models to gain conclusive constraints on the source partitioning of atmospheric NOx, consider this N isotope fractionation. 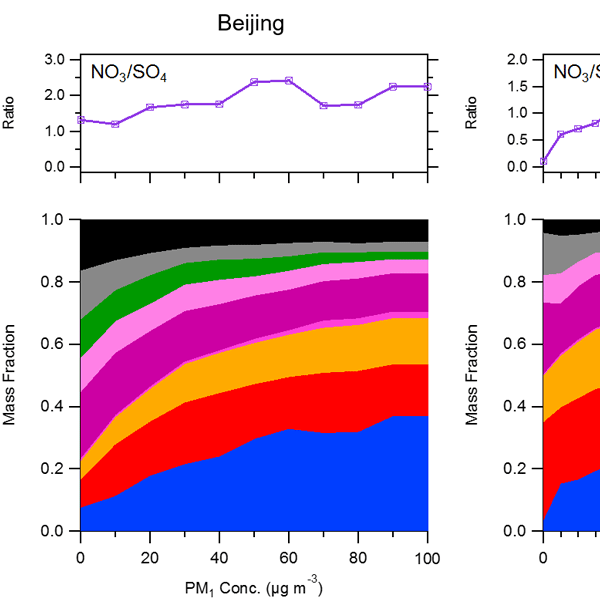 Future assessments of NOx emissions in China (and elsewhere) should involve simultaneous δ15N and δ18O measurements of atmospheric nitrate and NOx at high spatiotemporal resolution, allowing former N-isotope-based NOx source partitioning estimates to be reevaluated more quantitatively. Particulate amines play an important role for the particle acidity and hygroscopicity. We found amines were internally mixed with sulfate and nitrate at a rural site in the PRD, China, suggesting the formation of aminium sulfate and nitrate salts. The ammonium-poor state of amine particles in summer was associated with the low emission sources of ammonia and a possible contribution of ammonium–amine exchange reactions. Amines could be a buffer for the particle acidity of ammonium-poor particles. 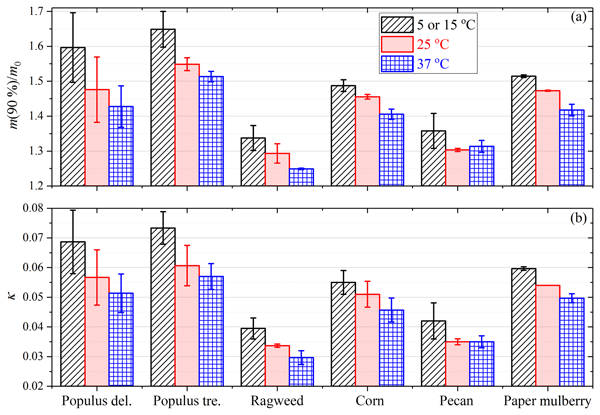 This study revealed the driving role of nitrate in urban haze development in the North China Plain (NCP) during summertime. Several factors favoring the rapid nitrate formation were investigated in detail. 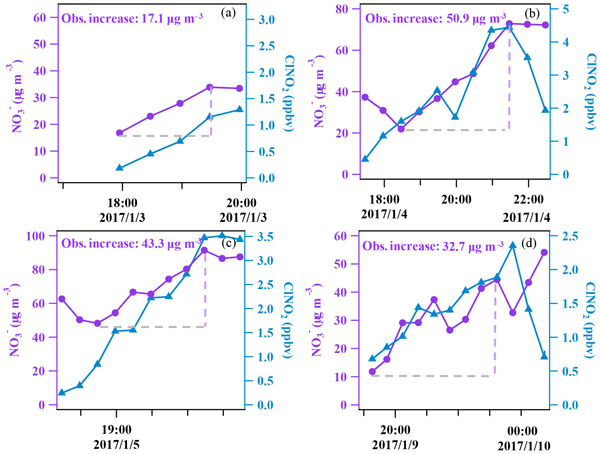 The higher concentration and, in particular, the higher contribution of nitrate in PM1 suggest an urgent need to initiate ammonia emission control measures and further reduce NOx emissions over the NCP region. Here we present a quantitative source apportionment of WSOC, isolated from aerosols in China using radiocarbon (14C) and offline high-resolution time of flight aerosol mass spectrometer measurements. We demonstrate a dominant contribution of non-fossil emissions to WSOC aerosols in the Northern Hemisphere. However, the fossil fraction is substantially larger in aerosols from East Asia and the east Asian pollution outflow, especially during winter, due to increasing coal combustion.